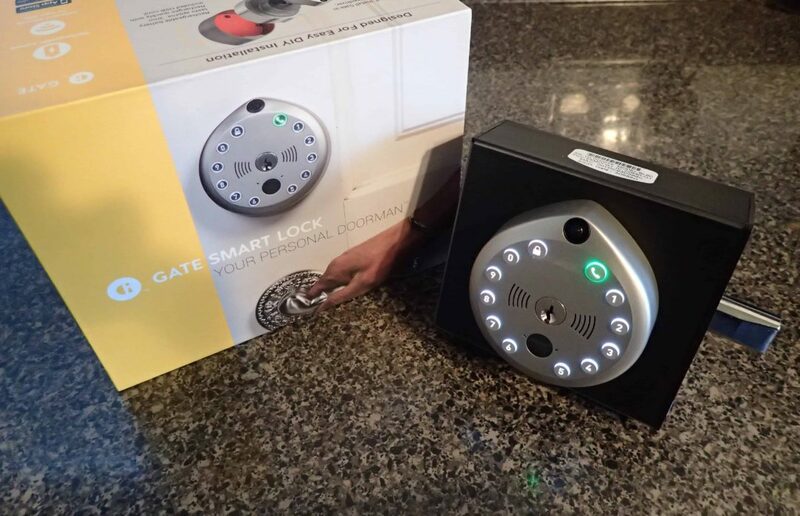 Gate Smart Lock Review: A Lock And Doorbell Cam In One? 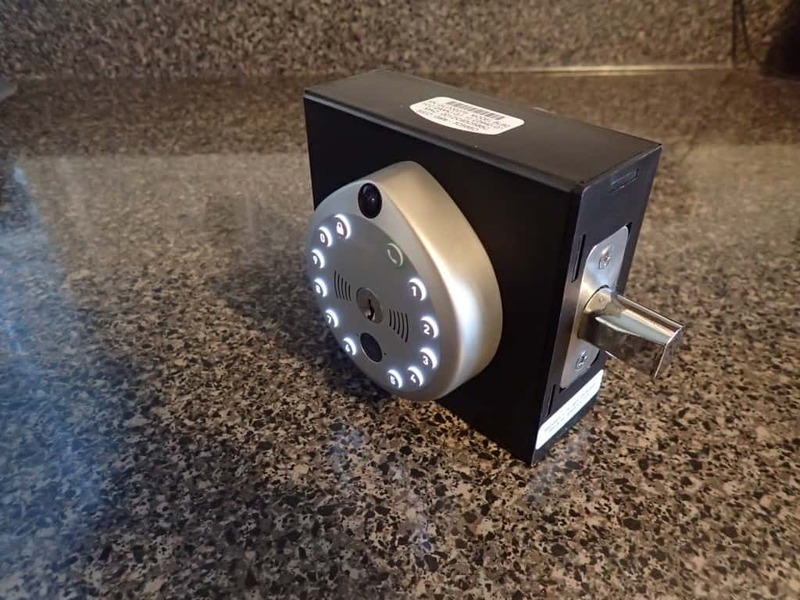 / Gate Smart Lock Review: A Lock And Doorbell Cam In One? My wife has been adamant about getting some kind of security system for our new (new to us) home. There tends to be some shady characters passing through our neighborhood from time to time. 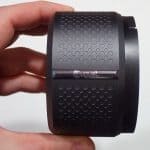 So, when I got the opportunity to test the new smart lock from Gate Labs, it was perfect timing. The Gate Smart Lock is a “first of its kind” product which combines the functions of both a smart lock and a video doorbell. I love the idea and the hardware seems sound. However, the supporting software is still lacking. Gate is both a smart lock and a smart video doorbell in one convenient package. 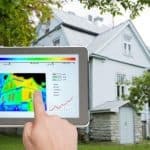 It allows you to remotely manage your home’s entrance. You can use Gate to: lock and unlock your door, view real-time streaming video, and talk to your visitor with real-time 2-way audio. I’m not an expert on locks, so I can’t speak on the quality of the locking mechanism itself (Sorry folks, I know it’s a popular way to test locks, but I’m not going to do the “beat it with a hammer until it breaks” test*). But, the build quality seems sufficient. The lock mechanism is, of course, made of steel. And, the casing appears to be made of aluminum. There’s no cheap plastic here. Gate is made to withstand the elements. So far, my Gate lock is holding up just fine in the middle of this cold, dark South Dakota winter. However, the manufacturer advises not to douse it with water. So, it’s probably best to avoid spraying it directly with a hose or exposing it to hurricane conditions. 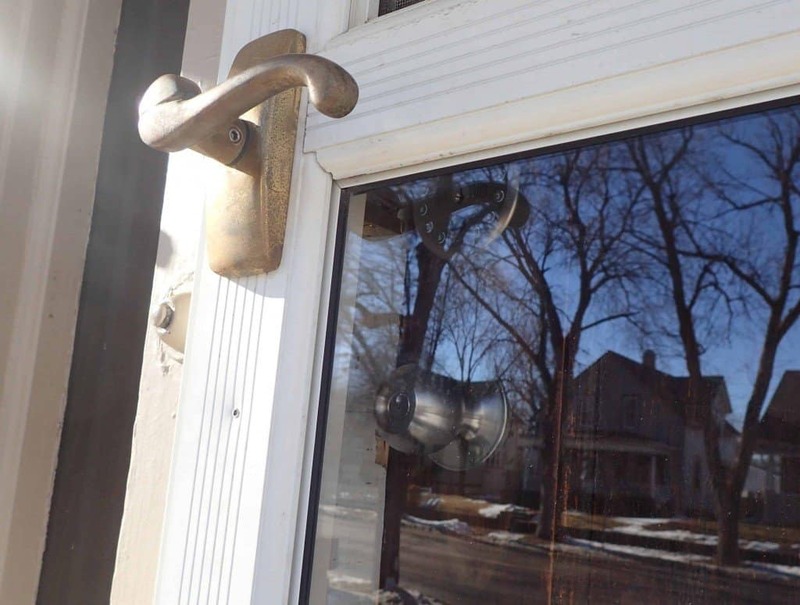 *Burglar Tip: If you are actually planning to beat something with a hammer, I think an easier idea would be to avoid any lock and just hit the sidelight window by my front door. Then reach around and unlock the deadbolt by hand from the inside. **This is in no way an endorsement to attempt to break into my home (seriously, my wife would be super-pissed). The Gate comes pre-installed on a plastic door blank which is a really nice addition. It allows you to test the lock before you go through the effort of removing and replacing your old deadbolt. Plus, when you remove the lock from the door blank, it’s easy to take note of how to properly put it back together. The Gate lock is a complete deadbolt so you’ll need to remove your old deadbolt before installing it. Installation is similar to installing any other standard deadbolt. It’s not a retrofit lock like some other smart locks. I just bought my house, which was built in 1909, and it looks like the front door is close to that old too. The old lock was a mortise lock which isn’t compatible with Gate (I did do the hammer test on my old lock and I can confirm that the it was not built to withstand several blows from a steel hammer). After I removed the old lock, I had to patch in the mortise hole with some scrap lumber. 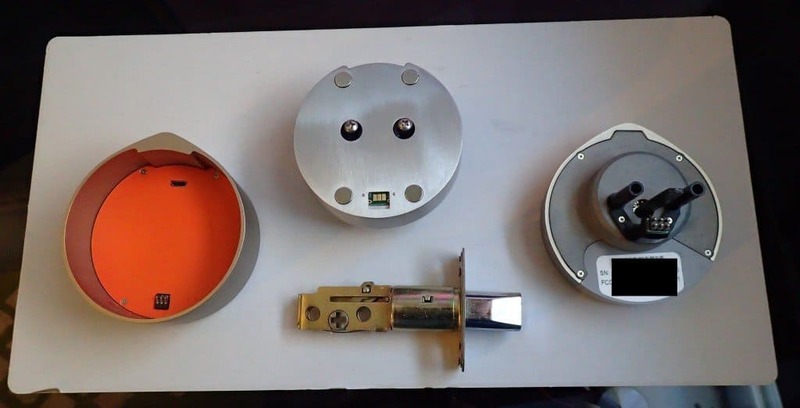 It’s not pretty, but it’ll do for the purpose of testing this smart lock. I’ve been planning on getting a new door anyway. Many well-designed smart locks can last 6 months or more on a single set of batteries. 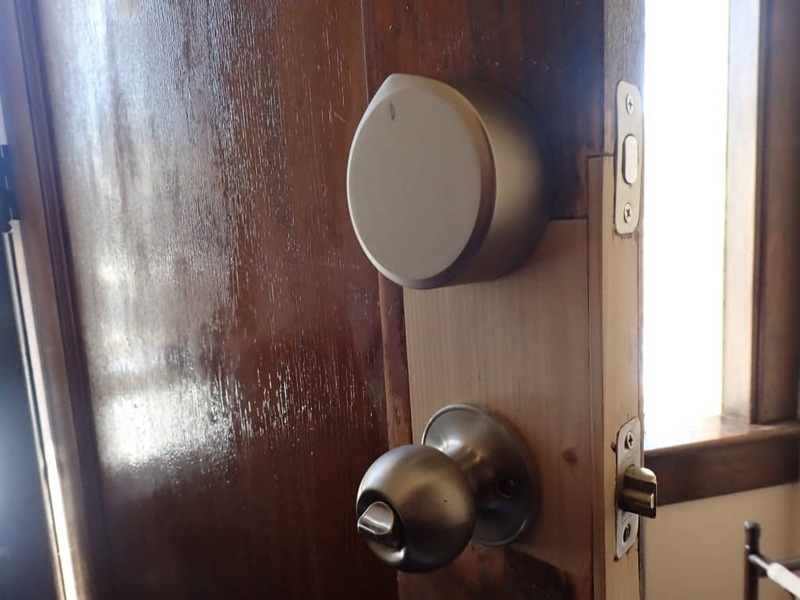 How will the Gate compare to these other smart locks? A device that uses WiFi, opens and closes your deadbolt, and delivers streaming video and audio must use too much power to be practical for batteries, right? Well, let’s see. My testing suggests that you can expect a battery life of 1 month for heavy use and 2-3 months for minimal use. I tested the lock in my office on the door blank. The battery lasted for a month. During my test, the motion was triggered an average of 10 times a day as I entered and left my office. Plus, I was frequently doing other tests as part of my normal product evaluation. I’m sure I used the battery sucking video quite a bit more than I would in a real use situation. For that reason, I believe the battery could last significantly longer in a real use situation. I average only 1 or 2 motion events per day on my porch. My actual use confirms this. I’ve had the Gate installed on my front door now for a little over two weeks, and as you can see, the estimated remaining battery life is 48 days. If that turns out to be an accurate estimate, I’ll be satisfied. 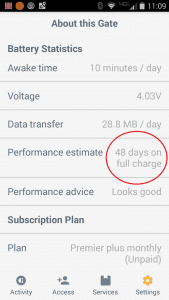 You can find the remaining battery life estimate by navigating from Settings/About this Gate, then scroll down. When I first received the Gate, I knew it had an internal battery that required recharging. I imagined having to run some kind of USB extension cord over to the front door every couple months just to charge the front door lock. That’s not the case. Instead, the back cover of the lock pulls off the door (don’t be afraid to give it a good tug, its held on by some strong magnets). 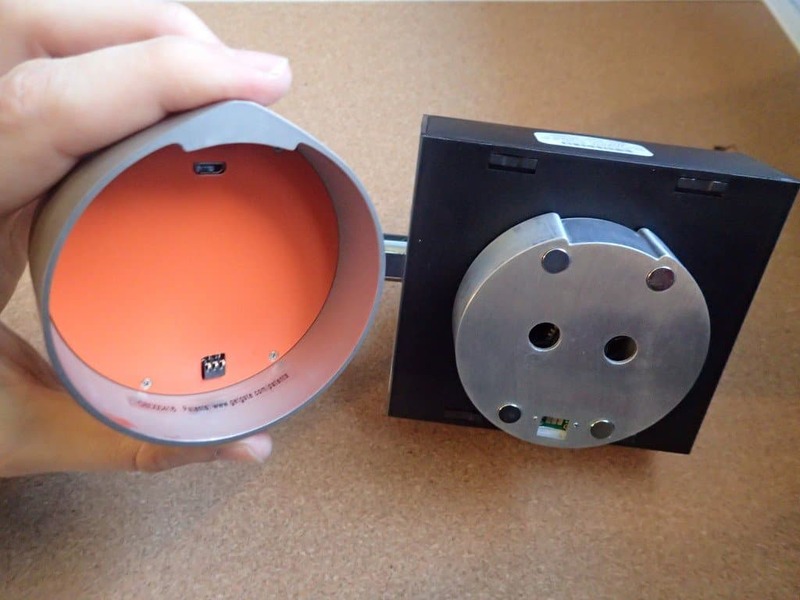 Inside the removable part is the battery and a micro usb charging port. I put the dead battery on the charger before I go to bed and it’s ready to be put back on the lock in the morning. I am without any smart features for the night, but the lock still functions as a normal lock without the battery. You can also purchase a backup battery for $60. That way when you need to charge the battery it’s using, you can just swap it with the backup and avoid any down time for your smart features. You can unlock the Gate using any of 3 options: keypad, physical key, or app. The keypad is a great feature for visitors. You can issue temporary keys that only work according to a schedule you define. However, it requires a subscription to one of the paid subscription plans after the initial trial. Remote access can also be managed with the app. When the motion sensor detects motion or when someone pushes the call button, a notification is sent to your phone and you can see a live feed of your door through the app. You then have the option to lock or unlock the Gate via the app. The peculiar thing is that you can’t remotely lock/unlock Gate on demand. There needs to actually be someone there to either trigger the motion or press the call button before the option to lock/unlock is available. Okay, keypads and remote access are cool. But to me, the most important feature of a smart lock is for it to automatically lock and unlock as I come and go. It does have an option to automatically lock after it’s been unlocked for a certain period of time. But, there’s no auto-unlock feature yet (I’ve been told its coming, though). There’s definitely some value in being able to remotely give visitors access to my house. But without any smart unlock feature, Gate doesn’t add much when it’s just me or my wife trying to get in the door. For me, I’ve found the most convenient way to use Gate right now is just to use the old-fashioned physical key. The streaming audio and video requires a lot of bandwidth. So, if you want to get timely notifications from Gate when someone is at your door, you’ll need a strong WiFi connection. When I tested the Gate in my office (which is in the same room as my WiFi router), I would receive notifications within 2-5 seconds. By the time I opened the app and used the unlock slider, it took a minimum of 10 seconds. Not bad. Once I had the lock installed on my door, the performance declined significantly. Notifications were unreliable and varied from 5 seconds up to 30 seconds and longer. But, I kind of expected poor performance because my front door is on the opposite side of my house as my wireless router. 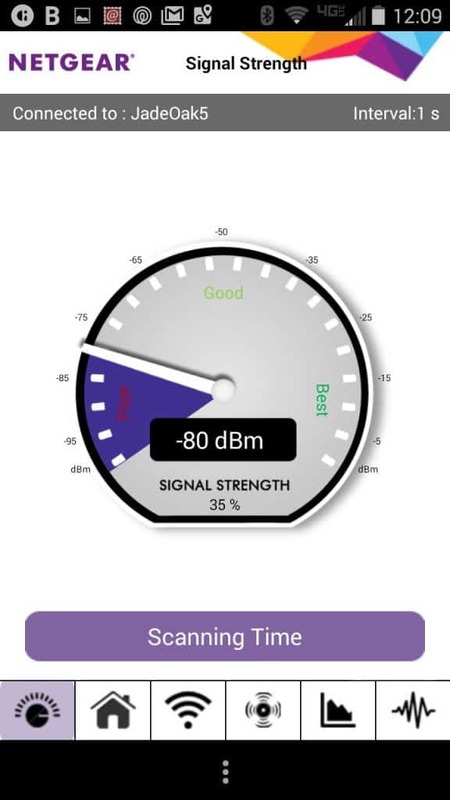 I checked the signal strength using both Gate’s in-app signal strength and Netgear’s app. Gate recommends a signal strength of at least -65dB which I am below. I’ve used quite a few WiFi products that have all kinds of problems when they get on the outer edges of the WiFi range. To Gate’s credit, it was consistently able to recover the connection and keep reporting back. Although I wouldn’t recommend using it with such a weak signal, I felt the performance given the weak signal was admirable. 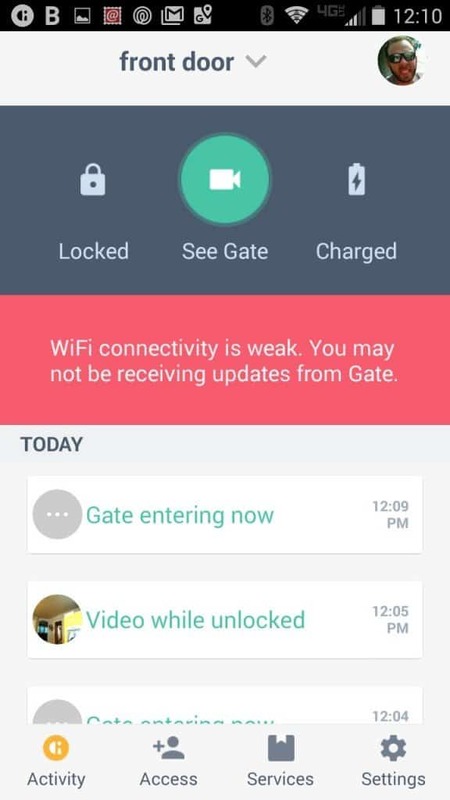 Gate definitely requires a strong WiFi signal to get a quality live stream. With a poor signal, you’ll experience choppy and laggy video and audio. The Gate camera is only 720p which surprised me. Everything else on the lock seems to be built to last, but 720p cameras are already kind of dated. Most of the competition’s cameras are 1080p. If you want to use it as a sort of security camera for action that is 15, 20 feet away, you would probably want the extra resolution. But if you just want to see the face that’s standing in front of your door, this will work just fine. On the surface, the idea of combining a smart lock and smart doorbell into one awesome smart device seems like a natural thing and a cool idea. And, for many people, it is. However, I was disappointed when I realized that my door front door has a screen door on the outside. The Gate is mounted on the entry door and the screen door completely obscures the view of Gate’s camera. So, unless my visitor knows to open the screen door, all the video features of my smart device are useless. On top of blocking the camera view, it also stops the motion detection from working. If someone happens to be lounging around on my porch or strolls up to pirate one of my packages, they’ll be safe from Gate, as long as they don’t open the screen door. 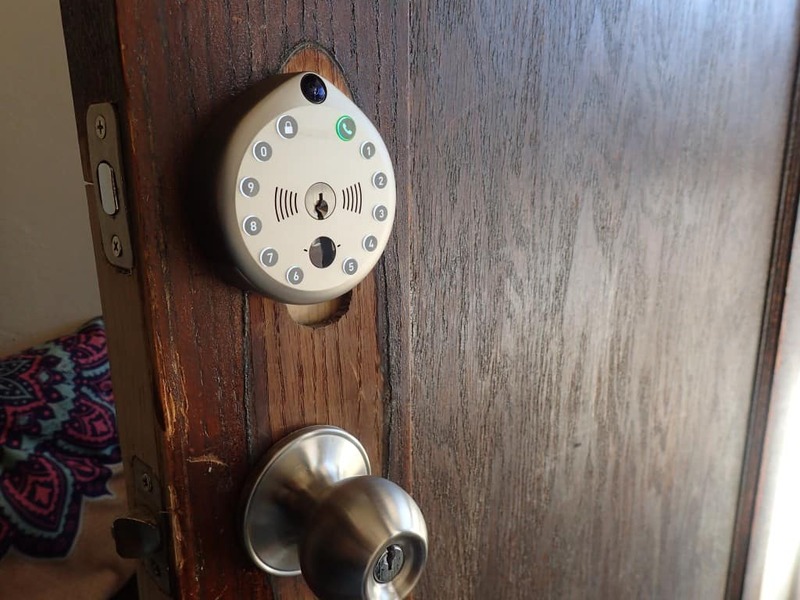 I think it’s safe to say you won’t get much benefit out of this smart lock if you have a screen door. You’d probably get a better experience by sticking to a traditional smart doorbell. Unfortunately, you can’t access all of Gate’s features without subscribing to a service. They have two tiers of paid subscription: Premier and Premier Plus. Currently, you get a free 30-day trial of the Premier Plus plan with your Gate purchase. The Basic plan (free) offers no scheduled access, a maximum of 4 permanent access admin users, and no saved video history. I know this sort of subscription service is common in the industry for cloud-based video access. And, as a business person, I totally understand the allure of a subscription service and the need to make money for a young company. But, as a consumer, it feels like a money grab. Given the unfinished nature of the product, I would feel more satisfied with a 1-year trial of the Premier Plus service instead of the 30-day trial that is currently offered. Gate is a really cool idea and I really want to like it. But in its early form, I’m hesitant to recommend it. I don’t think it’s a bad product. I just think it’s incomplete. In fact, the features that exist work well. 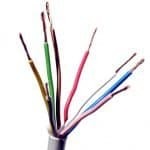 I was especially impressed with its ability to maintain and/or recover a weak connection. I think if they can push out an update so that the lock at least has the ability to automatically unlock when I get home, it would be a decent buy. Although I wouldn’t recommend it based on its feature set today, there’s lots more coming. I’ve been in contact with the manufacturer and they informed me that there’s a big update scheduled to be released this spring. If I use the quality of the existing features as a predictor of what’s to come, I think its likely that future updates will make Gate a worthy purchase. I’m looking forward to the update, and I’ll be sure to update this review when it happens. Gate is available for purchase on Amazon or directly from the manufacturer.